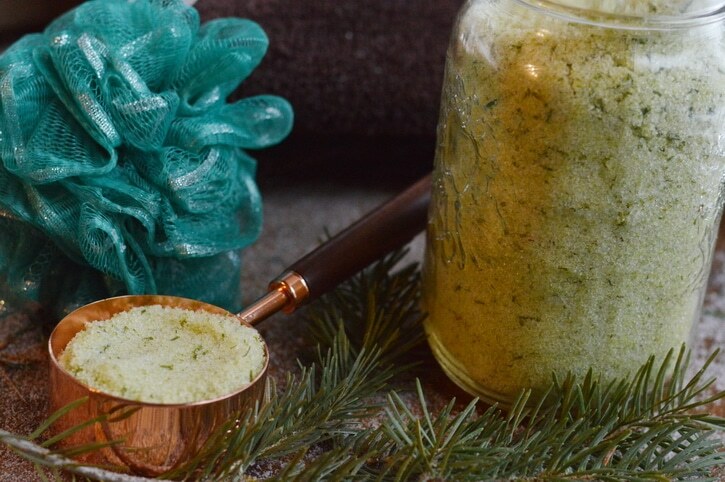 This detox bath salts recipe, made with foraged Douglas fir needles, is rich in health boosting actions to relieve pain, sooth inflammation, and get you feeling better faster. Make some now to have on hand when you need it during cold and flu season. Fir needles are easy to find year-round in temperate forests. The needles are fragrant, citrus-y, and antioxidant, reminiscent of grapefruit with a resinous quality. 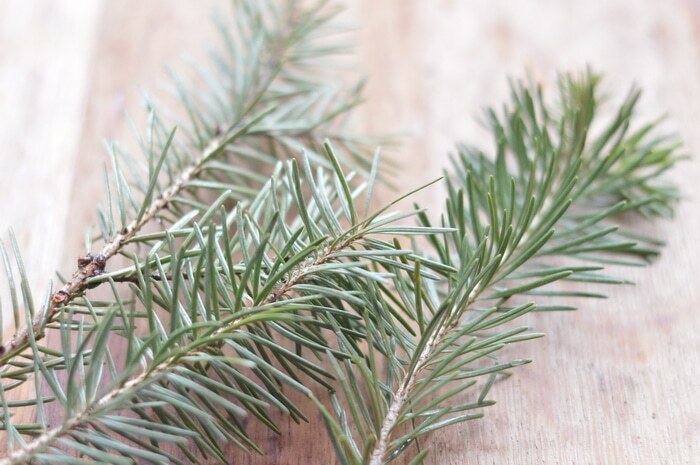 The medicinal and aromatic benefit of fir resides in the needles. 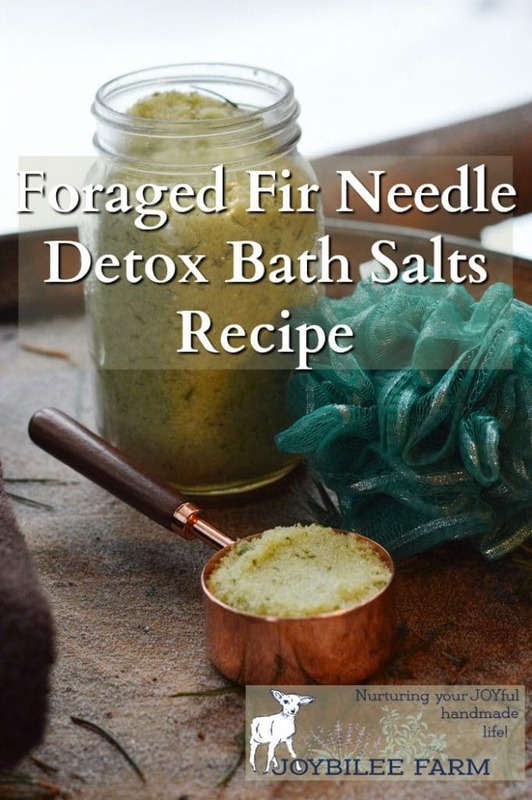 By harvesting the aromatic needles you can get many of the benefits of fir for your DIY projects, including this recipe for detox bath salts. 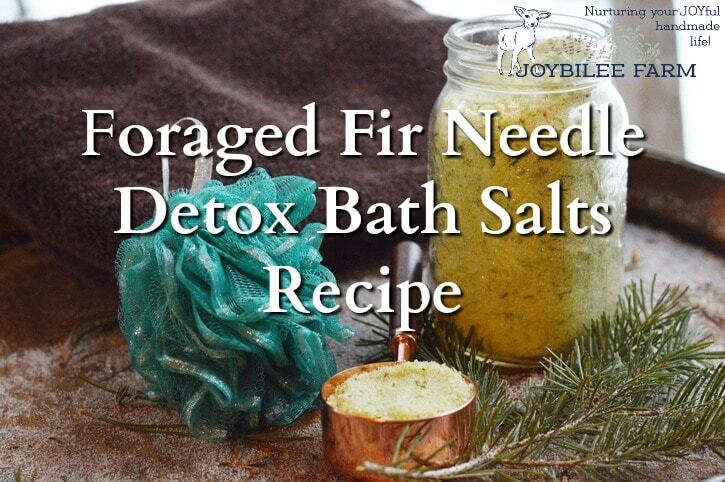 Fir, spruce, juniper, or pine needles can be used in these detox bath salts. Each offers a different scent, which is intensified when combined with Dead Sea salts in this recipe. But the therapeutic benefits are similar in bath products, whether you use pine, juniper, fir, or spruce needles for this recipe. Choose the one you have access to, that you prefer the scent of. The benefits and fragrance in conifers come from the essential oil constituents of the needles. Each tree has a different combination of A – pinene and B-pinene, limonene, and camphorous monoterpenes plus other essential oil constituents, which contribute to its individual fragrance and taste. Even trees of the same species may have a different balance of essential oils. Pick a tree or combination of trees that you enjoy the scent of when choosing needles for this recipe. Other than the spring growth, fir needles are relatively stable in their essential oil qualities throughout the year. So when you find a tree or two that you enjoy the fragrance of, you can come back year after year to harvest the needles. Winter cold is the best time to gather evergreen needles for this detox bath recipe. Fir needles can be harvested by pruning the branches from several trees. Just one branch will give you enough fir needles for this recipe. Although this recipe uses fresh needles, fir needles can be dried for future recipes. Never take the top branch from a young evergreen. The crown of the tree must be left intact or the growth of the tree will be stunted. I used Douglas fir for my detox bath salts recipe but you can use noble fir, grand fir, or Canadian balsam fir or any pine, juniper, or spruce that you enjoy the scent of. Avoid using yew needles. Douglas fir is considered a false fir and in a class by itself. I enjoy its grapefruit-like scent which stimulates the metabolism. The more I play with confer needles in the kitchen and in personal care products the more I love their tonic character. When choosing a tree to harvest needles from confirm that it is growing without toxic sprays, insecticides, or herbicides. You will want to choose a tree from a pristine location. For this reason, you may not want to use your Christmas tree for this recipe, unless you harvested it yourself from the wilds. Using the needles of local trees rather than relying on imported essential oils, means that you get a more potent plant ally in your arsenal of healing wisdom. These local trees are stressed with the same stressors that you also experience. If they are green, fragrant, and thriving they’ve been successful at mounting an immune response which you can also benefit from. That said, avoid using needles from a tree that looks stressed or diseased. First, they are fighting their own battle and we shouldn’t stress them further by taking their leaves. Second, if they look stressed, you want to avoid using them for herbal health support. They may not have what you need. This detox bath salts recipe uses fir needles for color, fragrance, and for their therapeutic properties. Use this bath twice a week or even daily during cold and flu season to invigorate your body and improve circulation, health, and well being. If desired you can increase the potency of this detox bath by adding essential oils but the bath is therapeutic without the added essential oils, too. 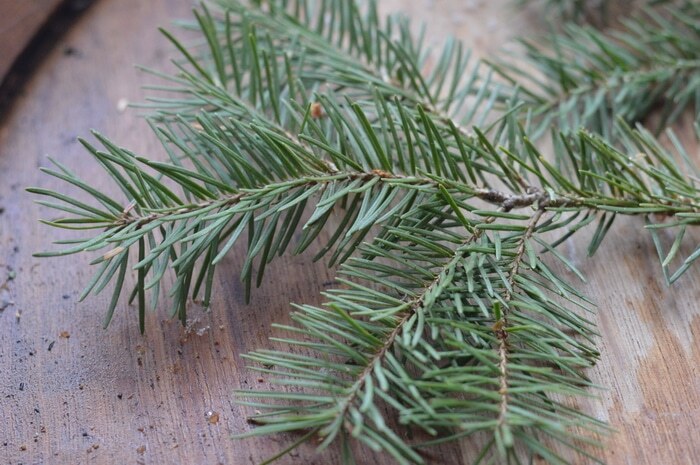 Harvest fresh douglas fir or other confer needles by cutting the needles from pruned branches using herb scissors. Cut the needles into very small pieces. 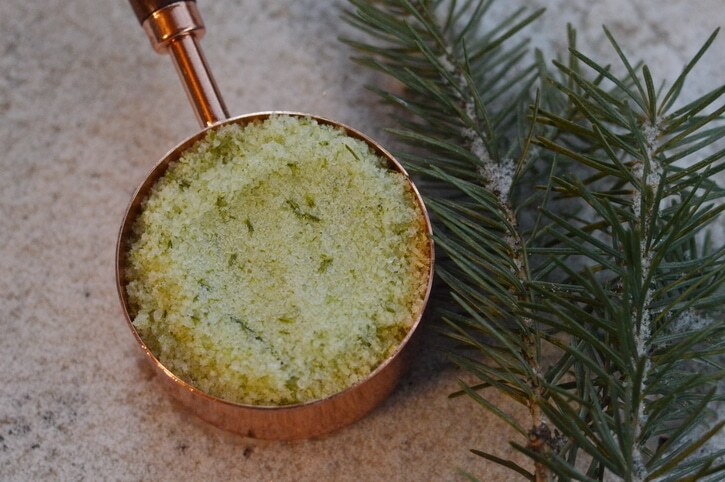 Place one cup of Dead Sea salt and 1/2 cup of herbs in a food processor or blender and blend until the salt has turned a chartreuse green and the fir needles are about the same size as the salt crystals. Repeat with the remaining half cup of fir needles. Pour the green salt mixure into a large bowl. Add the remaining Dead Sea salt. Stir in olive oil, sunflower lecithin or polysorbate 20, to keep the oil from floating on the surface of the bath water. Stir in essential oils, if you are using them. Pour the bath salts into a glass mason jar. Cap tightly to retain the volatile fragrance. Place 1/2 cup and up to 2 cups in a warm to hot bath tub. Add the bath salts just before entering the tub. Soak in the tub for a minimum of 20 minutes, adding more warm water to keep the bath steaming. 1/2 cup of this detox bath is enough to maintain relaxation and circulation. When you are congested or feeling unwell, increase the amount of bath salts to 2 cups to increase it’s detoxification and decongestant benefits. When you are feeling unwell, increase your opportunities for sweating and elimination can help you feel better faster. Sweat helps your body get rid of toxins faster, without forcing your liver and kidneys to work harder. Your skin is your largest elimination organ. Also when you sweat, you trick your body into acting as if the fever is broken and you are on the other side of the healing crisis. You can increase the detoxification by keeping the bath water warm, and then bundling up with a warm robe, cosy blankets and warm clothing to retain the body heat after a bath. Remember to drink water or lemon and ginger tea to restore your hydration after sweating. I used mineral rich Dead Sea salt in this recipe because it adds additional therapeutic actions and benefits. If you don’t have any Dead Sea salt you can make this recipe with himalayan pink salt or another natural sea salt. Don’t use processed salts because they lack the high quality mineral profile that natural sea salts have. Epsom salts can also be used in this recipe, as they are rich in detoxifying magnesium salts, however, they lack some of the trace minerals found in natural Dead Sea salt. This is the brand of Dead Sea salt I use. 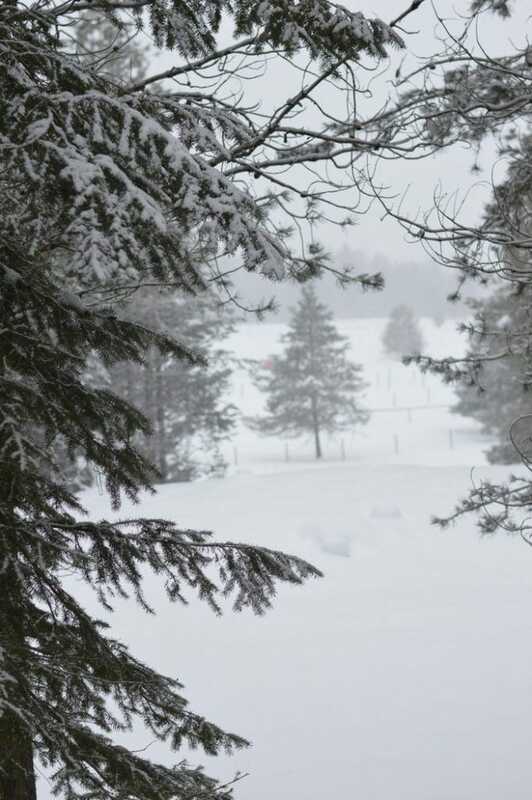 Conifers are an important foraging asset in winter when other plants are covered in snow. They provide medicine, nutrition, and food when other food is scarce. Knowing your wild forage assets can be lifesaving. This is really spectacular. There is such an abundance of resources right outside my door I never thought to harvest and use. Thanks for the recipe and also for the important shout out to First Nations people. Cedar grows so well here it’s actually invasive. Can I use cedar needles in this? What is the purpose of sunflower lecithin? Tara, the sunflower lecithin is an emulsifier that prevents the oils from floating on the surface of the tub and creating a slipping hazzard. You could also use the chemical polysorbate or turkey red oil. I will be making this in the spring, I have Black Spruce right outside and collect the spruce tips to infuse in oil. I’ll just get extra for this. You’re so lucky to have a Black Spruce right outside your home. I use Black Spruce Essential Oil and really love the fragrance.